In case you’ve been living under a rock, you probably know that Teemu Selanne makes his glorious return to Winnipeg tonight. According to TSN’s Sara Orlesky, Teemu has been looking forward to this day from the moment the NHL schedule was announced, way back in June. But regardless of how high his expectations are for tonight’s game, chances are that Selanne will be blown away by the outpouring of support he’ll receive from the vast sea of Jets fans. It will be an incredibly special night for Teemu and his family, who have flown down to . 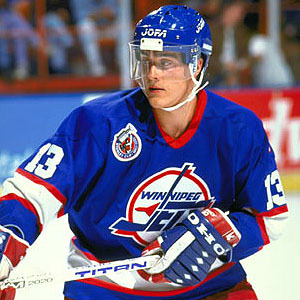 Despite the fact that Selanne played just 3.5 seasons in Winnipeg, he is among the two most beloved Jets in history. And though Dale Hawerchuk had a much longer tenure with the Jets (9 seasons), Selanne is absolutely revered by virtually every Winnipeg hockey fan under the age of 35. That’s because of the connection we all have to his ’92-’93 rookie season, which saw him score 76 goals and 132 points, and break almost every rookie scoring in the books. But not only is Selanne the best rookie in NHL history, he also posted one of the most dominant goal-scoring seasons for any player, ever. In fact, only three players have scored more than 76 goals in a single season – Brett Hull, Mario Lemieux, and Wayne Gretzky. (Alexander Mogily and Phil Esposito have each tied his total of 76). (1) Teemu Breaks Rookie Goal-Scoring Record! This entry was posted in Uncategorized and tagged Teemu Selanne, Teemu Selanne 76 goals, Teemu Selanne hat-trick, Teemu Selanne returns to Winnipeg, Teemu Selanne rookie goal record, Teemu Selanne Winnipeg Jets by Peter Siamandas. Bookmark the permalink.